Lillie has been suffering from nightmares for the past few months, but that wont stop her from trying to get to know the new guy. When Tom arrives it would seem he wants nothing to do with anyone, despite the interest from the girls of Green Grove, yet there is a connection between him and Lillie, even if he is trying to stop it. Lillie’s life is consumed by the nightmares and things becoming strange at school and with her friends but the two of them start getting closer and soon it becomes apparent that Tom may be able to help her make sense of the nightmares and what is happening around her. 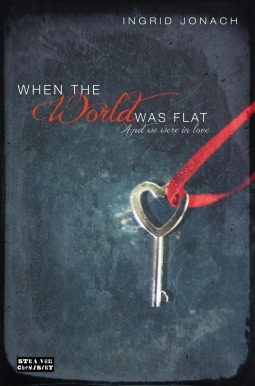 When the World was Flat (and We were in Love) first piqued my interest from its title, I loved things it suggested, a naivety about the character and obviously it wasn’t actually about them believing that the world was flat but it was still beautiful. The story started slow and I was worried that it was just another love story even though the blurb suggested there may be something more to it. I don’t really do love stories and the wait for it to become more was pretty tenuous. I wanted things to begin sooner but I think the development of the world was quite concise because of that so I can’t complain too much. Once things started to kick off with the sci-fi element of the story though I was hooked. Like I say, I don’t really do love stories and this book was full of the cliches you find in a lot of love stories but I loved it because of the sci-fi stuff. The characters didn’t really have much going for them to be honest but I was too intrigued not to like them. My favourite was probably Jackson as Tom was too aloof to really know and Lillie was a bit too self focused. She was so bothered about Tom and herself that she ignored the things going on with her friends and their troubles. Jackson was quite rounded and I liked the things about his past and how he has partially conquered his fears but they can still plague him. The writing style is what kept me reading when the story was going a bit slow, despite not connecting to the main character. I think one of the things I liked about the book was how real it felt, I knew people like those in the book, especially Melissa, Jo and Sylv. I have seen a few reviews complain about Sylv and her lifestyle or promiscuity but I thought it was true to life, there are girls like her around and she wasn’t actually as bad as she made out at all. I pretty much adored When the World was Flat even though I can’t pinpoint exactly what it was that I loved. I think it was a brilliant story when it kicked it and was written so well that even with the slow start I couldn’t fault it much more. This was Ingrid Jonach’s first YA book and I do hope that she has more published as she is obviously really talented. When the World was Flat (and We Were in Love) was published on September 5th by Strange Chemistry. My copy was sent in exchange for an honest review. *hugs* I hope she settles down soon. I don’t have children myself but I do work in a nursery and if it makes you feel better I’ve seen the other end of this. I take babies screaming and crying off their parents and see them settle and play. It won’t happen overnight but she will settle. In my nursery if they don’t settle we do ring the parents, and parents are allowed to ring as many times as they want. She will have lots of fun exploring and making bonds with other children and the staff, and soon you’ll be sad because she hasn’t cried, she hasn’t said goodbye, and goes straight in with smiles. I feel your pain. I had a terrible time when the girls were babies. But nursery was actually the worse. I ended up staying there with them. It will get easier, even if it feels so awful now. Big hugs, lovely.